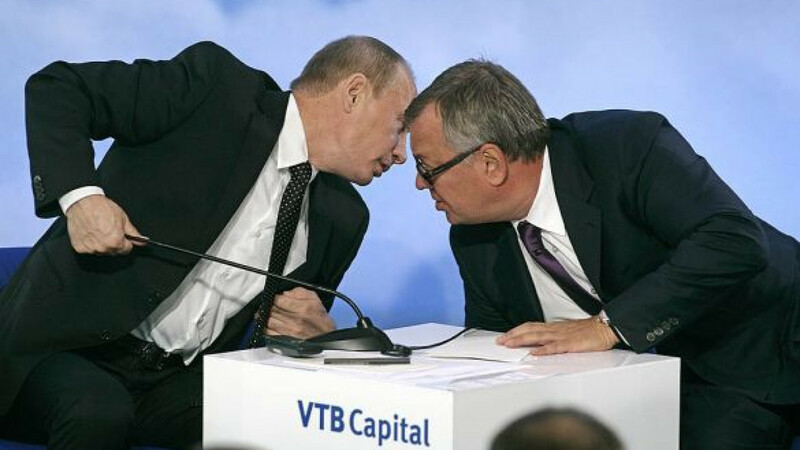 Head of state-controlled lender VTB, Andrei Kostin, was ranked the highest paid executive in the country, having earned about $30 million last year, according to a list published by Forbes magazine Monday. State company executives occupied the top five positions in the ranking by the magazine's Russian edition, with Kostin being closely followed by his peers from Gazprom and Rosneft. The list includes heads of 25 companies, both state-controlled and privately-owned. Gazprom chief executive Alexei Miller earned $25 million last year, overtaking the heads of other global oil and gas companies — James Mulva of ConocoPhillips and Exxon Mobil's Rex Tillerson, the publication said. "Heads of our biggest companies like VTB or Gazprom believe that they should earn no less than their Western colleagues," an executive head hunter told Forbes. The annual income of Rosneft CEO Igor Sechin, who took office only in May, is likely to reach $25 million as well, putting him on the third place in the ranking. Sberbank chief executive German Gref was ranked fourth with a more modest take of $15 million, most of which was received in bonuses — the part that largely depends on the lender's net profit, according to the publication. Gref's contract stipulates that the size of his bonus can reach up to 0.075 percent of Sberbank's annual net profit, which hit $10.75 billion last year, Forbes said. That means Gref could have earned almost $8 million in variable pay, it said. Bank of Moscow President Mikhail Kuzovlev was the last in the top five with a compensation of $15 million. Some companies whose executives were ranked by Forbes took an ironic stance, saying estimates provided by the magazine are far from reality. "Dubious methods of calculation by the experts resulted in the publication stepping on the unsettled ground of speculations and guesses. One can say that the figure was literally pulled out of the hat," a VTB spokesman told PRIME. The company's executive board members jointly earned about 608 million rubles ($19.2 million) last year, he said, citing a VTB financial statement. According to the estimates by Forbes, the total compensation of the group's key executives stood at $194 million last year. "Following Forbes' logic, VTB's executive board members have to pay extra for the honor of working in Kostin's team," the spokesman said ironically without elaborating. A representative of the Bank of Moscow, a VTB subsidiary, told Gazeta.ru that the estimates by Forbes are inaccurate, but declined to comment on Kuzovlev's official pay. Sberbank said in an e-mailed comment that the pay of any employee is confidential information. It's very hard to say whether the figures reported by Forbes are accurate, because the incomes of executives at Russian companies are "generally extremely secret information," said Luc Jones, a partner at Antal Russia Recruitment Company. The calculations provided by the magazine are likely to be based on comparison with the salaries of senior executives at similar foreign companies, "but it's rather guesswork," he said by telephone. Jones pointed out that state company executives usually enjoy greater benefits than just high salaries. "Working in state-owned companies, they occupy very powerful political positions, so the political connections these positions involve are probably worth a lot more than the salaries they receive," he said. Forbes said it had examined last year's revenues at 70 Russian companies, interviewed executive head hunters and used information from unnamed sources to calculate the amount of compensation. The income calculations took into account the size of annual salary, benefits and profit sharing, as well as the income coming from subsidiaries. Among those also listed are the heads of Gazprom Neft, Aeroflot and Norilsk Nickel. The magazine didn't survey state corporations, which are non-profit organizations, unlike other types of state companies. Companies owned by senior executives like LUKoil and Severstal were not surveyed either.